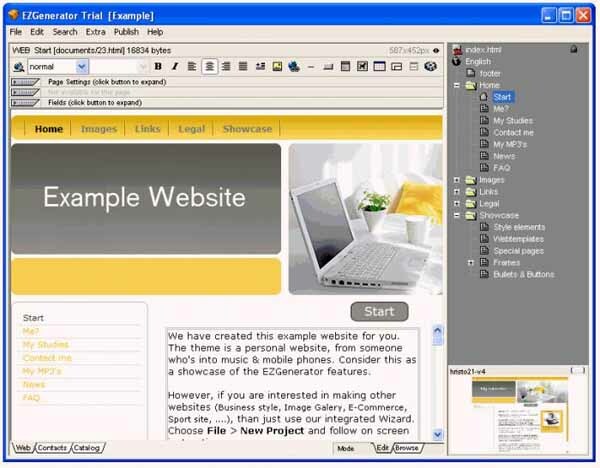 Free download EZGenerator Website Builder Latest Version.EZGenerator is a combination offline Website builder and online content management system.Create the structure of your website offline, add pages, blogs and other features then upload it and continue to edit ‘live’ content online. Easily create a website without installing any other software on your PC or server, EZGenerator does all the hard work for you and set-up everything you need to have online. There is no limitation on the number of websites you create with EZGenerator or in number of pages in each project.EZGenerator is also solution when you have to maintain several websites on different servers. You can control all your projects from same place. Our program supports you in generating the site you imagined, without limiting your creativity.You can use the web hosting of your choice (free or payable) to publish your EZGenerator created website.